The Ravens are auditioning a trio of offensive lineman today. 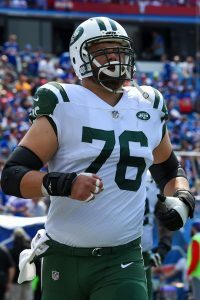 NFL.com’s Ian Rapoport tweets that the team is hosting Wesley Johnson, Hroniss Grasu, Jordan Morgan on work outs. The Ravens’ offensive line allowed four sacks to the Bengals on Thursday night, and the running game was only able to compile 66 yards on 22 caries (good for a three-yard average). The three players working out for Baltimore today either play center or guard, meaning the team is seemingly looking for some depth and reinforcement behind starters Alex Lewis, Matt Skura, and Marshal Yanda. Jermaine Eluemunor, who made the 2017 All-Rookie team, and rookie sixth-rounder Bradley Bozeman round out the team’s interior-line depth. Johnson, 27, has the most experience among the auditionees, as he appeared in 31 games (23 starts) with the Jets over the past two seasons. The 2014 fifth-round pick out of Vanderbilt joined the Lions earlier this offseason, but he was released by the team at the end of the preseason. Since then, Johnson had a workout with the Vikings. Grasu had spent his entire three-year career with the Bears before being released by the team earlier this month. The 27-year-old started 12 of his 14 career games, but injuries have limited him throughout his career (he spent the entire 2016 campaign on the injured reserve). Morgan is the only offensive guard in the group, and he also previously spent time with the Bears. The 2017 fifth-round pick spent his entire rookie campaign on the injured reserve, and he was released by the organization earlier this month.